4. Alauddin promoted Malik Kafur to the rank of Malik-naib or Vice- Regent of the empire. Malik Kafur (died 1316), was a slave who became a head general in the army of Alauddin Khilji, ruler of the Delhi Sultanate from 1296 to 1316 AD. He was originally seized by Alauddin’s army after the army conquered the city of Khambhat. Malik Kafur led two campaigns in South India. The first against Warangal and other against Dwarasamudra and Madurai. He was made malik naib, the senior commader of the army after his Southern campaigns. Ibn Batuta was Muslim Moroccan explorer, He is known for his extensive travels, accounts of which were published in the Rihla. Rihla is medieval book, which recounts the journey of the 14th century Moroccan scholar and traveller Ibn Batuta. Hence, the option D s correct. Giyasuddin Balban came upon the throne at a time when the Delhi Sultanate had fallen into utter confusion due to the incompetence of the successors of Iltutmish. The country was subjected to foreign attacks. he reorganized the armed forces and thorough reforms were introduced in civil administration. Under his orders new strong fortresses were built in the north-western frontier. He saved the Sultanate from impending disintegration. So he should be considered as the ‘savior of the Delhi Sultanate’. The third and most destructive attack came when the ancient Nalanda University was destroyed by the Muslim army led by the Turkish leader Muhammad-bin-Bakhtiyar Khilji in 1193. It is believed that Buddhism as a major religion in India had a setback for hundreds of years due to the loss of the religious texts during the attack. Muhammad-bin-Bakhtiyar Khilji was a Turkish military general of Qutb-ud-din Aybak. The biggest credit in his record is the conquest of Bengal, which marks the beginning of Muslim rule in the region, which turned predominantly Muslim in the subsequent years. 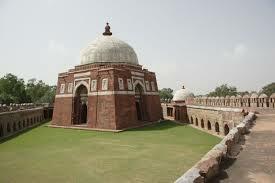 Tughlakabad was a heavy fortified city built by Ghiyasud-din Tughlaq, the founder of Tughlaq dynasty, in 1321. The city was built to keep away the Mongol marauders.